This classic and elegant HomCom Modern Jewelry Armoire is a great acquisition for storing all types of jewelry. Featuring a flip top with inset mirror, four deep storage drawers and two side cabinets concealed by doors, this piece of furniture is an ideal jewelry storage system that will make an easy addition to any home’s decor. With clean lines and an elegant design, this modern jewelry armoire, from HomCom, adds a classical hint to any room decor, whether you decide to place it in your bedroom, hallway, dressing room or even retail store, while keeping your entire jewelry collection safely stored and organized in one place. It provides ample and safe storage space for all of your jewelry items, having specially designed sections according to your jewelry’s size and type. The classy and elegant black color will fit perfectly in any room or home setting. Made out of durable, lasting material inside and out, that resists to warping and scratches, the HomCom Modern Jewelry Armoire will become your favorite home investment, lasting throughout the years. The qualitative material is made of density board and flannelette. Two side doors and four distinct drawers that provide multiple storage options, for example for hanging long chains, bracelets, necklaces, and earrings. The top flips open to reveal even more storage for rings and earrings, plus a fashionable mirror that can be hidden away when not in use. This jewelry armoire stands on four turned legs, which confer stability. 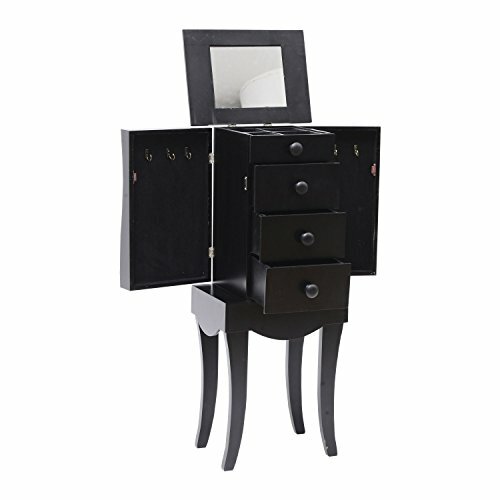 Finished in a dark black color, the HomCom Modern Jewelry Armoire represents the ultimate deal when searching for a qualitative and elegant piece of furniture that will emphasize your home decor and will keep at the same time your jewelry and accessories neatly organized and stored.